If you’re a mandolin enthusiast, it doesn’t get any better than this. An international gathering of mandolin players celebrating the diversity of the instrument and sharing an unforgettable week of music camp--surrounded by the meadows and redwoods of the beautiful UCSC campus. 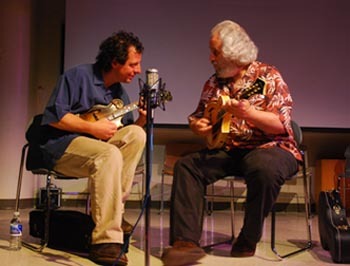 Founded by legendary mandolinists David Grisman and Mike Marshall, the annual Mandolin Symposium at UC Santa Cruz is now heading into its eighth year, beginning on June 26. “For six days we turn Santa Cruz into mandolin heaven,” said Marshall, who just performed at the Telluride Bluegrass Festival last weekend. Marshall was invited to join the original David Grisman Quintet in 1979 at the tender age of 19. He has since performed and recorded with some of the top names in acoustic music, including Tony Rice, Darol Anger, Mark O' Connor, Stephane Grappelli, Bela Fleck, and Chris Thile of Nickel Creek. 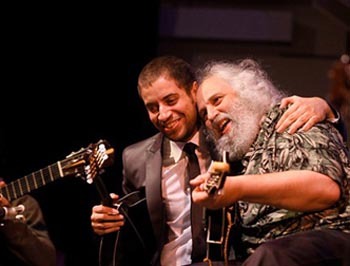 Bringing with them nearly a dozen other mandolin masters, Grisman and Marshall hope to expose students of all levels to the incredible variety of mandolin music and technique developed throughout the world. “David Grisman and I have thrown this giant net over the whole of the musical world, and we are using the mandolin as our compass,” Marshall noted. “Many people don't know that the mandolin traveled all over the world when it left Italy in the late 19th century, and since then has reinvented itself in each new place that it has been,” he added. 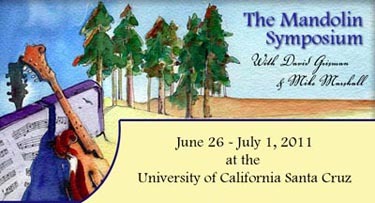 Each day at the UCSC symposium begins with a music appreciation class, where students listen to--and view--historic performances hand-selected by the faculty. A variety of elective classes follow, from beginning to advanced, with students given the opportunity to create small ensembles in the many different styles of mandolin music. Evening sessions feature special performances and workshops by the instructors, with organized jam sessions beginning each night around 10 p.m. The weeklong symposium ends with a public concert on Friday, July 1, at 7 p.m. in the Stevenson Event Center. 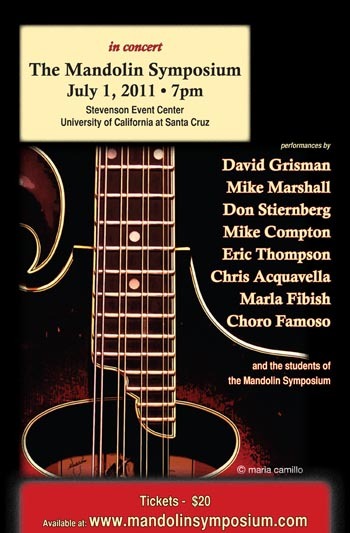 This year’s show will feature David Grisman, Mike Marshall, Don Stiernberg (swing and jazz), Mike Compton (bluegrass), Eric Thompson (old time), Chris Acquavella (classical), Marla Fibish (Irish traditional), and Choro Famoso (Brazilian)—plus a piece performed by all the students of the Mandolin Symposium. “It's an incredible six-day mando-freak out! With some of the best players and teachers in the world.... that's all,” said Marshall.